Wishing you and yours the most Amazing Holiday Season from the Entire Novation Family! In our 17 years in business, Novation Settlement Solutions has helped 1000s of people reset and relaunch their lives. Novation Settlement Solutions named to Florida Trends 2017 Best Companies to Work for, here is why. One phone call gets you $50. Don’t have any copies? NO PROBLEM. Please meet successful investor and business owner Tyler, with excellent advice for others looking to finance their dreams and build a better future. 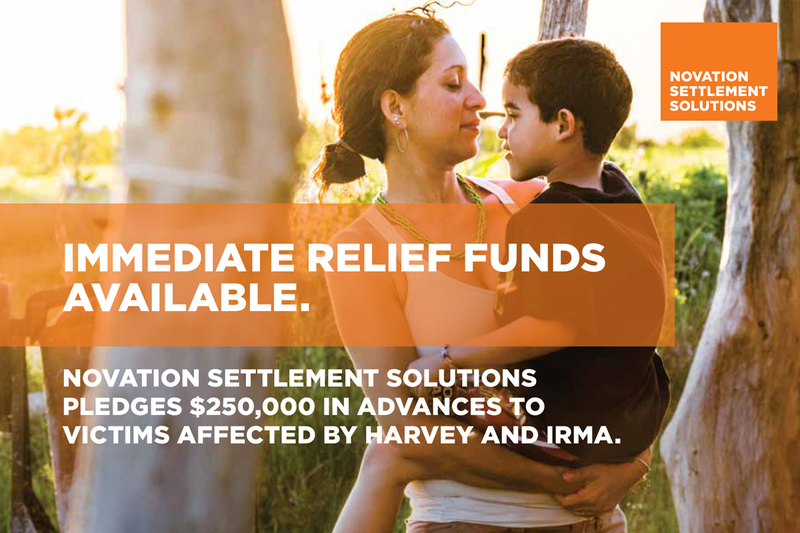 $250,000 IN ADVANCES TO VICTIMS AFFECTED BY HARVEY AND IRMA. Hurricanes Harvey and Irma have had a catastrophic impact on the lives of so many in Texas and Florida. As a Florida-based company, no one understands that more than Novation. That’s why we are providing customers with immediate cash advances of up to $5,000 to help reset and rebuild lives. Read more testimonials about Novation Settlement Solutions on Google. Learn more about our Novation Settlement team, or talk directly with one of our experts. I understand that Novation Settlement Solutions or a related or an unrelated company may contact me by email or phone to discuss my inquiry.